For many people, when the kids go back to school, the months of summer sun and frolic turn to thoughts of fall, and work takes on a more serious tone. That can mean more hours spent at a desk. And without the proper support those added hours in front of a computer can lead to a stiff neck and shoulders, back pain and tight hips. But with an embodied approach, you can banish that discomfort for good! Here are a few tips to help you reduce the tension and strain in your neck, shoulders, low back and hips. 1. Find a chair that allows you to place your feet flat on the floor, with your thigh bones parallel to the ground. If you’re short, like me, sometimes it’s hard to find a chair at the perfect height. If that’s the case for you, raise the floor instead! Place a book or small box under your feet. 2. Drop the weight of your feet into the floor, relaxing your thighs and hips. Feel your sitz bones dropping into the chair, a little like garden stakes into the earth. Avoid tucking your tail under. 3. Feel the length of your spine floating skyward. You don’t want to force it into a long, tight position. Instead, imagine your vertebrae like corks on a rising tide. When you find that sensation, your torso will begin to feel long and light. 4. Relax your shoulders down your back. Avoid “pinning” them down with extra muscle in the armpit and shoulders. Instead, imagine that they can slide down your back like melting ice cream. Allow your collar bones to melt wide at the same time. 6. Make sure your work surface is the right height. You want to be able to hang your upper arms, with the lower arms at about 90 degrees. As you work on your computer, support your wrists long – no drooping! 7. If you’re using a big ball at work, instead of a chair, to promote an active core – don’t assume that the mere fact of having the ball is all there is to it. It’s just as easy for the core to bail out while sitting on a ball as sitting on a chair. Adopt some of the tips above, and you’ll get a better response from your core musculature. The feeling should be light and easy – not effortful or stiff. 8. Don’t assume that an ergonomic set up will do all the work for you either! 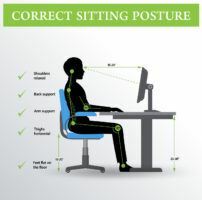 Having your desk, computer and chair at the right height and position for your body is important. That positioning will make it easier to sustain a position that allows you to work comfortably. But notice how you are sitting as well. What is tight that doesn’t need to be? What can you let go of? Where is the real, easy, deep support? 9. Check in with yourself after you’ve been working for a while. Can you still feel your feet on the floor and your sitz bones in the chair? Can you feel the length of your spine and neck? Can you feel the hang of your shoulders? Sometimes, even with the best of intentions, your focus on your work creates a situation in your nervous system where it’s really easy to lose the great, fundamental support you’ve set up. If find yourself slouching and disconnected, shoulders up around your ears, don’t beat yourself up. Get up and move around a little. Shake your booty. Hang your shoulders. Wiggle. Re-set the body and your nervous system. Then sit back down, ready to try again. The more you practice these few little things with attention, the better they’ll get over time. The better you get at sustaining them, the better you’ll feel over the course of your day – whether you’re sitting at the computer or not! 10. Get up FREQUENTLY and move around a little bit, even if just for a couple of minutes. This allows you to re-set your body, re-set your nervous system and re-set your mind. Find a chair of the appropriate height, at pull it up close to a bare wall. Sit on the forward edge of the chair, facing the wall, feet flat on the floor at hip width apart. Feel your feet dropping into the floor, sitz bones dropping into the chair, with hips and thighs relaxed. Feel the crease at the hip joint soft and deep. With the spine supported long and upright (not leaning forward), place the palms of your hands on the wall at about shoulder height. Imagine you have Spiderman hands – they stick to the wall. You don’t have to push into the hands to keep them there, but you want them to stick to the wall without falling. Re-assert this connection from time to time as you go through the exercise. Float the head skyward, allowing the shoulders to melt down the back like ice cream. Let your ears soften and melt down. Feel the space between your shoulders and your ears. Allow the weight of the arms to melt down through the elbows toward the floor, all the while lengthening the spine and feeling the sitz bones and feet into the floor. Allow a little breath into the back of the armpits, between the armpits and the front of your shoulder blades. Imagine there’s a little pocket of air under there, supporting the weight of your hanging shoulder girdle. Allow a little air up under the collarbones and sternum as well. Allow the neck to find length. Breathe into this for several minutes. Feel your body gradually lengthen and expand from the inside out, with the outer layer melting and relaxing. You may actually feel your shoulder girdle shift back a little to hang better on your spine – but don’t force it. Check in with various parts as you go along, gradually feeling the whole of the body lengthen and settle. Let the arms slide slowly from the wall until they are hanging by your sides. Feel the space between your shoulders and your ears. Feel the length of your neck and the width of your whole shoulder girdle. If you find that this exercise helps you alleviate stiff, sore and overworked shoulders, keep it in your repertoire of “little fixes” that you can do anytime, anywhere. Then think about actually training some new motor control strategies that will help you support yourself if you spend long hours at your desk. It’s important to train to support the things you do most often – and for a large number of people, that involves long hours at a desk. Simple strategies like the ones described above can help. And then, when you’re finished work for the day – find a way to move around some more. Climb stairs, walk the dog, go cycling with the kids, dance around your living room – whatever! Spend some time moving your body in different ways. My family often finds me with the music cranked up, dancing around the kitchen while I make dinner. It’s not all I do – but it sure shakes off whatever tension may have accumulated over the day. If you can follow these simple tips, you’ll find that stiffness in your neck and shoulders goes by the wayside. Tune in to how you feel. Bring your attention to the state of your body as you work – and adjust what’s not working. You will feel exponentially better – I guarantee it!